I am clearly conflicted on my handling of personal details. My blog isn’t titled First Name Last Name dot com. I find myself reluctant to use my name or yodel on about where I live. Yet, my name is a byline on every writing clip. With that, archived author bios on Google show where I live. It’s hardly the witness protection program around here. And yet, I do worry about unspecified Internet crazies storming my real or virtual driveway. I read one story about an Internet stalker [Meeting a Troll, summary on Gawker] and decide that the Internet is a wretched hive of scum and villainy. Such is the power of the story that it freaks me out even if it might not be true [point, counterpoint]. If this specific evil did not happen, a similar evil could happen, and furthermore will happen to me. I whip myself into a frenzy despite the fact that no reader has given me the slightest cause for alarm. Everyone has been universally polite, supportive, and interesting. We listen to anecdotes and ignore the statistical risk. Just because I recognize the silliness of this behavior doesn’t mean I can stop doing it. My childhood was lovely but hardly carefree. I grew up in Manhattan. The earliest rules I remember involved when to cross a street to avoid getting squashed by a taxi, why not to go into Central Park at night, and how to recognize the dangerous and crazy among us. In any big city, 99% of the residents are perfectly decent human beings. However, in a city of 7 million, 1% is 70,000 people, one of whom might be next to you in a crowd. I think not being forward with specifics is my reflexive equivalent of not meeting the eyes of the person sitting across from me on the subway. The lessons you learn young never leave you. But mainly, I’m not used to thinking of my identity as a part of the story. When I write an article with training tips from a Big Name Rider or barn advice from a Recognized Expert, the only name the readers want to hear is that of the subject. My name appears in the byline and on the check. The only two people who care about that are myself and the editor. Sure, I buy Car & Driver when John Phillips writes an article, but who else other than writers read bylines or photo credits? How do you address identity on the Internet? Blithely, until now. As we have discussed, I’m taking my blog private for the very real reason that people we don’t particularly want reading are reading it. So, time to limit who has access to it. And, I have always assumed that I would stop writing once I was living in the US. I write about travel. We travel during school holidays. Letting the entire internet crazy world in on the secret that we will be out of our home for two weeks every school holiday strikes me as the epitome of stupid. Discretion is the better part of valor. On the other hand, with the internet the way it is, if they really, really want to find us, they will. 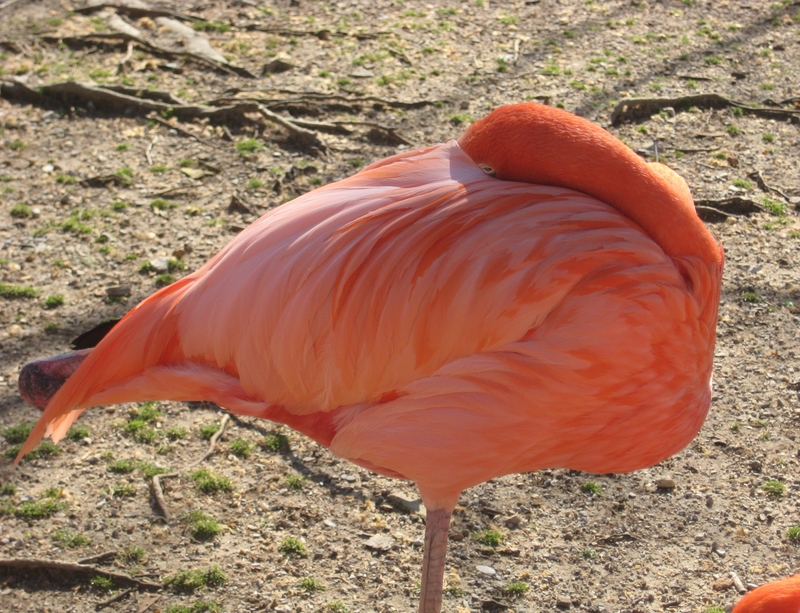 By the way, I finally realized that your photo is a flamingo. Were you perhaps trying to find an ostrich? If you blow up the photo, you can see his (her?) eye just over the feathers. I liked the image of peeking out from cover. Didna work as well as a thumbnail. I was born in Manhattan. Identity is a curious thing. As mentioned in my last blog, my name turns up all over the internet in places I did not suspect. I can go online and get a picture of the house I grew up in here in Maryland. And it’s just as easy to find someone’s name and information even for someone whose computer skills are minimal. Like me. Be concerned, be careful, don’t get so paranoid that you can’t function. How is the word “glance” applicable in the sense in which you used it? I don’t understand what you are trying to say.